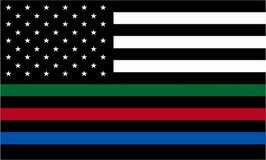 Top quality Police Thin Blue Line flags made from durable heavyweight knitted-Nylon. They are finished with a strong canvas heading and 2 brass grommets. These flags look great both outdoors and indoors. Top quality Police Remembrance 3'x5' flags made from durable heavyweight knitted-Nylon. They are finished with a strong canvas heading and 2 brass grommets. These flags look great both outdoors and indoors. Top quality Police Mourning 3'x5' flags made from durable heavyweight knitted-Nylon. They are finished with a strong canvas heading and 2 brass grommets. These flags look great both outdoors and indoors. 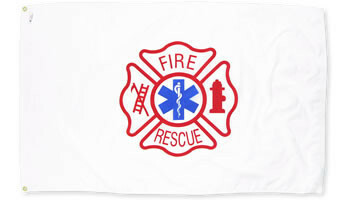 Top quality Fire Department 3'x5' flags made from durable heavyweight knitted-Nylon. They are finished with a strong canvas heading and 2 brass grommets. These flags look great both outdoors and indoors. Top quality Firefighters 3'x5' flags made from durable heavyweight knitted-Nylon. They are finished with a strong canvas heading and 2 brass grommets. These flags look great both outdoors and indoors. Top quality Firemen 3'x5' flags made from durable heavyweight knitted-Nylon. They are finished with a strong canvas heading and 2 brass grommets. These flags look great both outdoors and indoors. 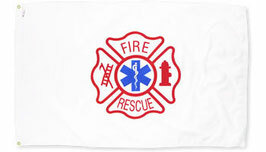 Top quality Fire Rescue 3'x5' flags made from durable heavyweight knitted-Nylon. They are finished with a strong canvas heading and 2 brass grommets. These flags look great both outdoors and indoors. Top quality Fireman Remembrance 3'x5' flags made from durable heavyweight knitted-Nylon. They are finished with a strong canvas heading and 2 brass grommets. These flags look great both outdoors and indoors. 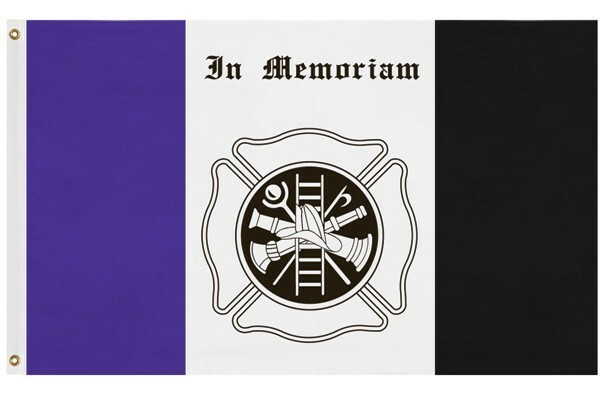 Top quality Fireman Mourning 3'x5' flags made from durable heavyweight knitted-Nylon. They are finished with a strong canvas heading and 2 brass grommets. These flags look great both outdoors and indoors. 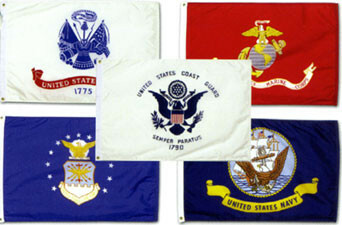 Top quality EMS 3'x5' flags made from durable heavyweight knitted-Nylon. They are finished with a strong canvas heading and 2 brass grommets. These flags look great both outdoors and indoors. Top quality Star of Life 3'x5' flags made from durable heavyweight knitted-Nylon. They are finished with a strong canvas heading and 2 brass grommets. These flags look great both outdoors and indoors.